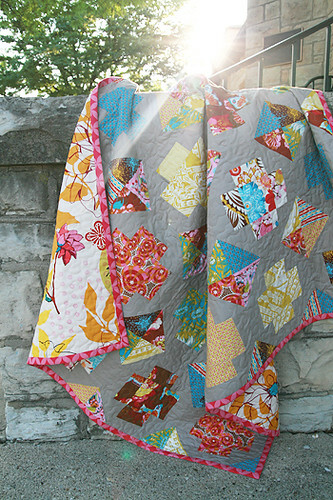 I'm so excited to share my latest quilt with you, Loulouthi Crosses. 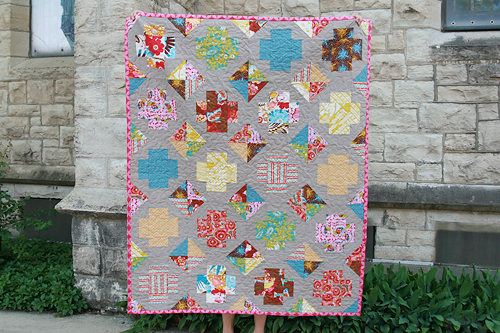 This quilt is made up entirely of Greek Cross blocks from the Summer Sampler Series. 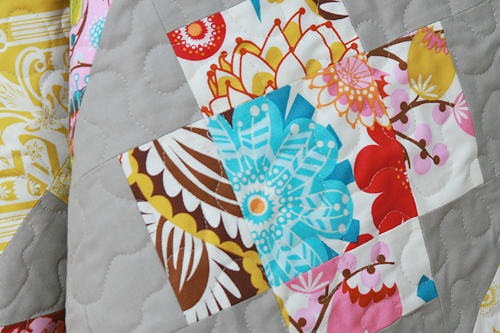 I love that you can take one unsuspecting little quilt block and make such an interesting quilt from it. 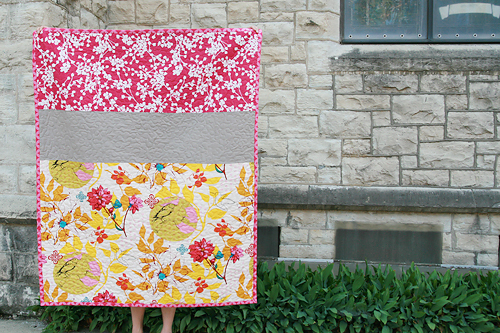 For the quilt front, I used about a fat quarter of each of Anna Maria Horner's Loulouthi fabric in the Isabela palette. I used Moda's Bella Solids Stone for the sashing. Not to be confused with Kona Stone. Which I did confuse when reordering after I ran out. Twice. That was not a cheap mistake. I am pretty excited about the back. Do you have any fabric that you bought a long time ago with no immediate intention of using, but just loved too much to pass it by? That was me with the Anna Maria Horner Drawing Room fabric you see at the bottom of the back. Originally I thought I would wrap canvas with it and hang it on the wall, but my wall has been filled with other handmade items. So it sat, waiting for the right project. I just love that AMH's fabric collections continue to coordinate. The top fabric on the back is an out of print Amy Butler piece, Pink Coriander. I had stocked up on that awhile back and I think I'm finally down to my last yard. The binding is another Anna Maria Horner fabric, this time from her Good Folks line. That one I am almost out of, and boy will I be sad when I use my last piece. I quilted this in a free motion meandering style. I had some tension problems on the back that I discovered once I was finished that required me to spend a lot of time with the seam ripper. I'm hoping some of you can relate. All in all, I really love how this one turned out. It measures 48" x 60" and is listed in the shop!